It's summer here in the Philippines and the heat has made me lazy to do my nails. Aside from that, work has been getting most of my time. The moment I get to my studio for some "me" time, all I want to do is go to bed. But last night was different. I was arranging my clothes and found a handful of orange shirts. That took me by surprise. As I am not fond of pinks, I am also not fond of orange, especially on my nails. I think it doesn't compliment my skin tone. Anyway, I then thought of doing some nail art inspired by the color. So I stopped what I was doing and began painting my nails. Isn't it amazing where one can find inspiration for a nail design? Since it's summer where I live, I decided to use a bright orange as base color. I chose to wear 2 coats of Dazzle Dry Orange Sorbet to serve as my background color. (Reviewed and swatched here.) It is not the brightest of oranges but it was the shade I thought I can wear. The design is freehand and I used a short stripper nail art brush and acrylic paints. I wanted an nail design that was easy to do and fun to look at. This may sound funny but I actually wanted this to look like rain. With our very hot and humid weather, I am always wishing for rain to cool down the heat. Hence, the broken lines. Initially, I only wanted white lines. But after doing my left hand, I thought it needed more colors. I didn't want to overpower the orange base so I decided on highlights instead. I used yellow and light blue that I randomly painted over a few white lines. I liked it better with the additional colors. It looked more fun. Perhaps I will eventually like orange polishes as I did with green. If you have been following this blog long enough, you'd probably remember that I used to dislike green nail lacquers. But when I found a good green to try and liked it, I developed a fondness to greens. I am actually looking forward to more green shades. 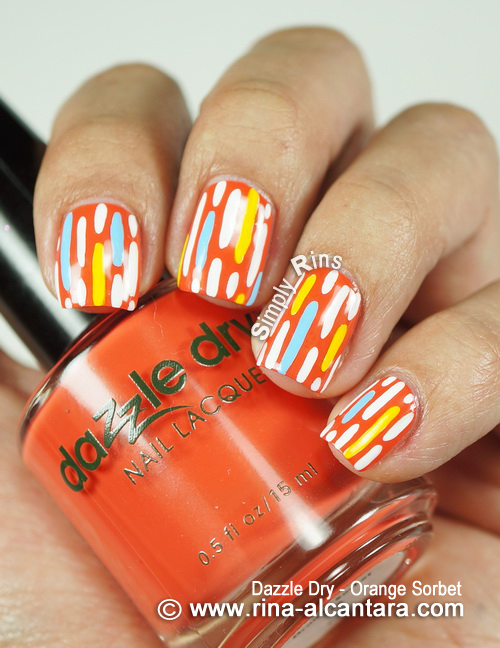 Dazzle Dry is including one in their summer collection and I am definitely looking forward to getting my hands on it! If you are a nail art beginner and is looking for a design to practice on, I recommend this to you. It is easy to do even with your non-dominant hand. Details and precision are at a minimum as you only have to watch out for spacing. P.S. Yes, I finished fixing my clothes on my closet. P.P.S. As of this post, Dazzle Dry Philippines is having a month-long sale this May 2013 on all nail lacquers, trinity kit, matte top coat, and cuticle oil. Please visit their Facebook page at http://www.facebook.com/DazzleDryPhilippines/ for your orders and inquiries. I get soooo excited every time you post. I check everyday. Love your blog! These are so fun and such a sweet simple design. Would look amazing in other colors as well. Thank you again for a beautiful all over print. I hope I'll continue to inspire with you with my nail designs. These are absolutely lovely! I don't really like orange that much either but with white, blue and yellow, it looks amazing. And i love bright colors for spring and summer! Lovely - your design always remind of art on canvass! This is so pretty, it looks so clean! 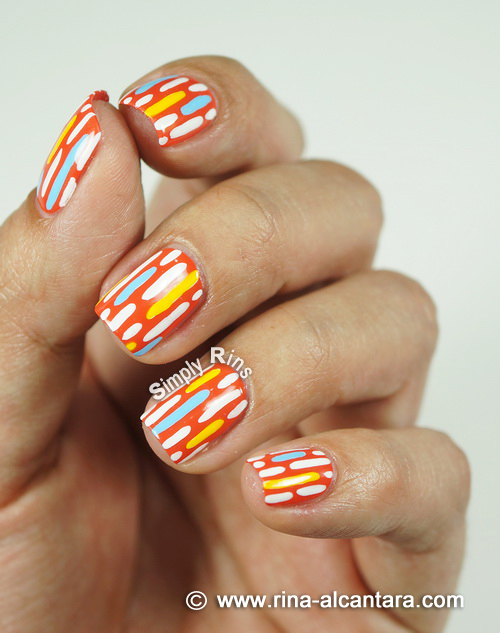 Also I don't think orange is one of "my" colours, but this one is very nice :-) Great inspiration, beautiful summer manicure! It's funny and it looks lovely.